April 2018 - Read. Think. Act. (Apr. 30, 2018) Catherine Read speaks with Fairfax County Democratic Committee Chairman Dan Lagana. Ninety days into his term, Lagana speaks about the upcoming primary elections, the grass roots effects of the Democratic blue wave washing over the commonwealth, and gerrymandering. 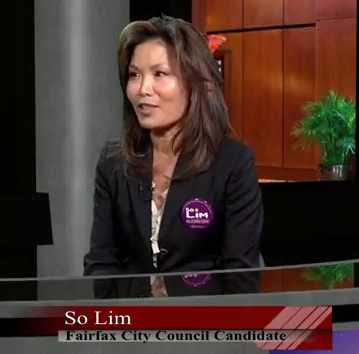 He notes that his job as FCDC chair is to get Democrats elected to offices throughout the county – from Supervisors to School Board to Sheriffs to the Soil and Water Council in Fairfax County. Although some of these offices that are up for election are non-partisan, Lagana notes that the candidates can still seek party endorsements, and the party can harness its resources and organizing power to help elect like-minded candidates. Lagana spoke in detail about the election of school board at-large member Karen Keys-Gamarra, which took place in the late summer of 2017. Karen sought FCDC’s endorsement for an oddly timed special election, and by having her campaign work collaboratively with FCDC, they were able to work together to prevail. Catherine also brought up the question of the municipal elections in May – asking Dan what his thoughts were on this process. Dan believes that all elections should be in November, as it front and center on everyone’s mind, and the turnout is likely to be higher. Following the 2016 election of President Donald Trump, local democratic committees across the country saw a rise in participation and membership. On a local level, grass-roots disrupter groups like Network Nova and Win Virginia gained a lot of traction by bringing in people who had never before been involved in the political landscape. This helped usher in a blue wave last November, as Democrats picked up 15 seats in the House of Delegates. Lagana believes that FCDC has welcomed these newcomers with open arms, and promotes that more participation in the political process can only make us stronger as a county, state and nation. He shares that he has been working hard to make FCDC an inclusive environment, where everyone has a voice and a seat at the table. 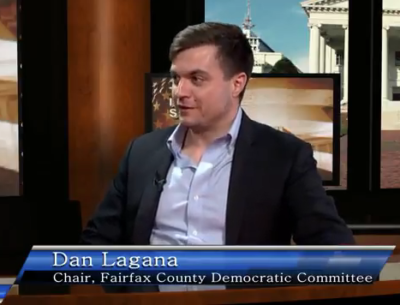 As chair of the FCDC, Lagana reiterates that it is his job to help elect Democratic candidates to office in Fairfax County. 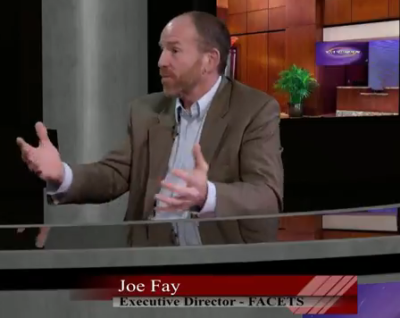 As for how the districts are drawn, from the Supervisors to the Congressional districts, he thinks that there is much work to be done in Virginia on making it a more fair process. When the party in power is the one drawing these districts, the outcome is fairly predictable – that party will do whatever it takes to stay in power and protect incumbents. Lagana looks to states that have implemented a bi-partisan process for re-drawing districts for ideas. Although not perfect, states like Arizona have made strides to improve how it can be accomplished. As for gerrymandering cases making their way through the court system, in Wisconsin lawyers for the case of Gill vs. Whitford are currently awaiting a decision to see if the Supreme Court will hear the case. This will be a telling sign, and have an impact on gerrymandering cases throughout the country. The fact that SCOTUS has opted to not hear the Pennsylvania case where the districts have been re-drawn, may be an indicator that they do not want to get involved. 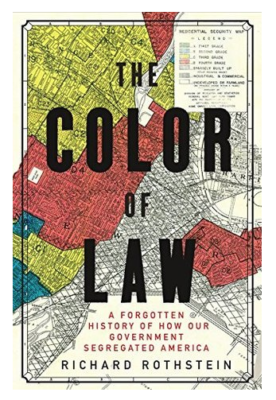 Lagana notes, however, that in order for things to change there must be a change to the law, or some sort of test, to show that the districts are fair. Without this, he is convinced that it will be business as usual. 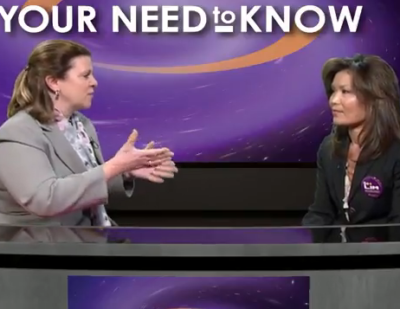 In the final segment of the show Catherine speak with Lagana about the upcoming primaries in the 10th Congressional District. There are 6 primary candidates vying to go up against Rep. Barbara Comstock, who is thought to be vulnerable this year. The 10th district is routinely listed by the Cook political report as one of the most competitive races in the nation in 2018. There are 49 Fairfax County precincts inside the 10th District, and Lagana invites all eligible voters to take some time getting the know the candidates, and be sure to get to the polls on June 12, 2018 for the primary. There will be many opportunities to meet these candidates at local forums, including the Democratic Business Council of Northern Virginia (DemBiz) forum, on Friday May 4th at Maggiano’s in Tysons Corner. Lagana notes that the 10th District spans a large geographic area, from the wealthy inner suburbs of McLean all the way out to the West Virginia border in Clark County. It will be important for everyone to participate in the primary process so their voices are heard and counted. If you would like to support the FCDC, they are holding their biggest annual event, the Jefferson/Obama dinner this Sunday May 6th at the McLean Hilton in Tysons Corner. Registration is open to all, and Lagana encourages people to come hear what is happening across the county and help raise funds to support the critical job of helping to get out the vote. Special guest will be Senator Tim Kaine, who is up for reelection this year, along with Lt. Gov. Justin Fairfax. FCDC will be tipping its hat to the blue wave election of 2017 by having newly elected Democratic Delegates introducing the keynote speakers. Vienna Jammers – David Reynolds, Jr.
(Apr. 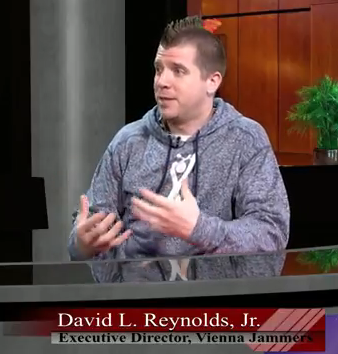 25, 2018) Catherine Read interviews David Reynolds, Jr., Executive Director of Vienna Jammers, a percussion ensemble in the Vienna area with over 120 youth musicians aged 8-18. Their mission is to educate youth through unique percussion programs, provide a dynamic and diverse experience in the performing arts, nurture the creativity of every child, and enrich lives within the community. Vienna Jammers was established in 2005 as an after school program at Vienna Elementary School, where David Reynolds serves as a Music Educator. Dave Cohen, then a high school student and percussionist at James Madison High School, approached Reynolds about starting a percussion ensemble for elementary school aged children as part of a service project he was looking to launch. The after school program gained much notoriety, and began performing out in the community at high profile places like Wolf Trap Center for the Performing Arts and the Verizon Center during a halftime show. By 2013, Reynolds had upwards of 70 children wanting to participate in the ensemble, with slots for only 20 children available. So he started exploring ways he could grow the program and expand participation. Reynolds knew of a similar, well-established percussion group based in Louisville, KY called the Louisville Leopards. 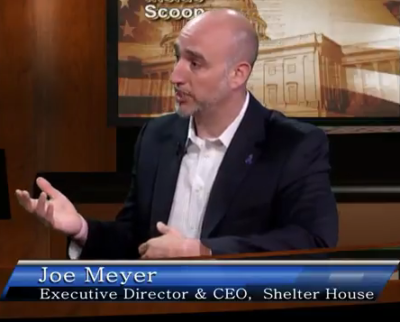 He reached out to their director, Diane Downs, to see if he could learn more about how their program operates. He took off on his spring break that year to visit the group and learn as much he could about their program. Diane was generous with her time, and helped Reynolds learn how he could move the program from being an after-school program to more of a community based organization. Reynolds returned home, and shortly thereafter established the Vienna Jammers as a 501C-3 nonprofit organization. They were able to grow their participation exponentially, and they now have 120 students ranging from 8-18 participating in a number of ensembles. The students play on a wide variety of instruments; traditional drums, steel drum sets, bongos, marimbas and even trash can drums. Reynolds notes that percussion is a very easy entry-point to making music – it doesn’t require any special training or instruction to pickup a stick and start banging on a surface. Of course, he notes there is a difference from banging on a table and making music, and that is what they focus on teaching their students. 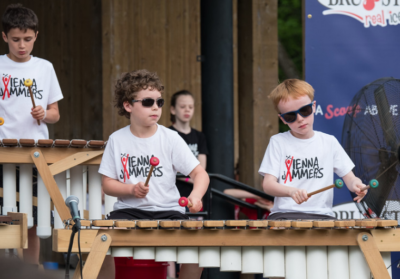 Vienna Jammers offers a robust summer camp program, which serves as an introduction to the instrument, as well as an audition to participate in the yearlong ensemble programs. They have two different tracks for students to choose from with the yearlong program, where students can practice either once a week or twice a week, depending on their interest and commitment level. The organization is continually looking for opportunities for the musicians to perform. This year the group traveled to Atlantic City to perform at a conference for Music Educators, at a volunteer reception held by the Mayor of Vienna, as well as at the Vienna Halloween Parade. They also seek out opportunities to bring music to those in the community who would otherwise not be able to get out and see them. The ensembles performed this year at Jill’s House, a home for special needs children in Vienna, and a number of retirement communities in the area. Vienna Jammers operates year-round, with a 9-month program that coincides with the school year, and a robust offering of summer camp workshops. Students pay tuition, but it doesn’t cover all of the costs needed to operate the organization. Reynolds notes that they receive grants from The Arts Council of Fairfax, as well has having a number of corporate sponsorships to help subsidize costs. He also shared that scholarships are available if students are interested, but do not have the financial resources to make the tuition payments. Additionally, tickets are now on sale for their annual performance called the Big Jam, to be held on May 6th at 4pm at James Madison High School in Vienna. Come on out to support the Vienna Jammers and to hear some fabulous music that will lift your spirits! (Apr. 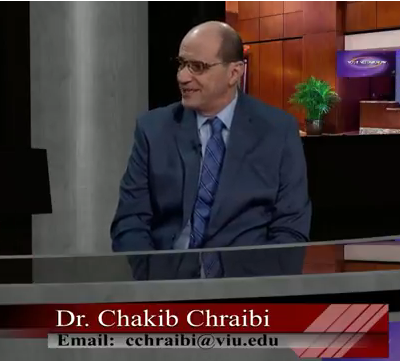 13, 2018) Catherine Read interviews Dr. Chakib Chraibi, Dean of Computer Information Systems at Virginia International University, about the Artificial Intelligence (AI) revolution. AI is defined as the ability of a machine to perform cognitive functions associated with the human mind, such as perceiving, reasoning, learning and problem solving. Dr. Chraibi speaks with Catherine about how AI will impact our society and culture in the years to come. Dr. Chraibi notes that Artificial Intelligence is already being used by most of us on a daily basis. Applications such as GPS help us by processing information regarding traffic, to assist us in getting where we need to be on time. Voice activated assistants such as SIRI (Apple), Alexa (Amazon), Google Assistant, and Cortana (Microsoft) are designed to help us stay organized and solve everyday problems. These tools are very powerful and can help us become significantly more efficient in our everyday lives. Although there are many benefits of artificial intelligence, Dr. Chraibi shares that some are worried about job disruption and the ripple effects AI can have on the worldwide economy. Studies show that approximately 1.8 million jobs will be eliminated with the rise of AI. However, the introduction of AI into new industries will result in the creation of about 2.3 million new jobs. The difference is that AI will be eliminating many jobs that are considered low skilled, while the new jobs that are being created will be higher skilled. The key to making this transition, according to Dr. Chraibi, is to properly prepare the workforce to meet the demand. The exciting prospect of bringing artificial intelligence to the workforce means that we can use these powerful tools to help solve many of the big problems facing the world at large. In order to help us better understand artificial intelligence, Dr. Chraibi explained the basic process of how computers learn information. Supervised learning happens when humans feed data to a machine, and then teach the computer how to recognize information so that it can then make decisions. An example of this is Spam software. Programmers feed features of spam email to the computer, and the spam software can learn the information and make decisions on how to sort the mail into categories. Unsupervised learning takes this to the next level. Programmers feed data to the computer, and the machine is then able to find patterns in the information on its own. This is a more powerful and newer form of artificial intelligence. For the first time in history, we have seen supercomputers such as IBM’s Deep Blue beat the human world champion in the game of chess, IBM’s Watson win in Jeopardy and Google’s AlphaGo win in the Chinese strategy game Go. This is because machines have the ability to store more data than the human mind, learn the patterns and quickly apply their knowledge to solve problems. Ultimately, computer scientists are searching for the “master algorithm” which would allow a machine to solve any problem. If this is achieved, computers could supersede humans in intelligence, something that is is called singularity. The question then becomes “what role do humans have in society?” Overarching concerns include whether or not social and emotional learning can take place, and wonder if morality be imparted to a non-human device. Computer scientists also worry that if we reach this point, a computer could refuse a command from a human, and choose to make its own decisions. This would enable computers to essentially take over the world, making human beings less relevant and no longer in charge. An excellent book on this topic is The Rise of Robots by Martin Ford.